Way cool! I've been using my bike to commute between my place and G's all summer due to your good role-modeling. Parking is really a pain in his neighborhood and it's been really a nice way to start my day with a ride through DC city streets as the city is just waking up. I think once the humidity drops here in DC I'll be biking to work too. Love the playdate via bike. 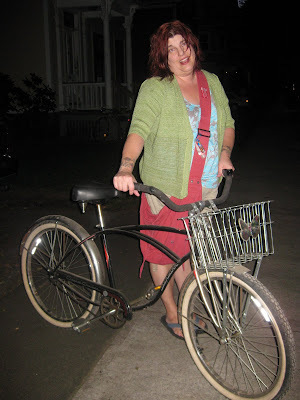 Love the GNO via bike even more. Wish I still lived in NH, I'd GNO on bike with you two. We could even Cargo bike it together! Finally that coffee trike is sweet. ( I'm still thinking of a business I can do at the farmer's market when the kids are older via my trike. I wish I spun- as I would love love love to sell handspun wool in my trike at the farmer's market. Our market needs a craft tent for sure. 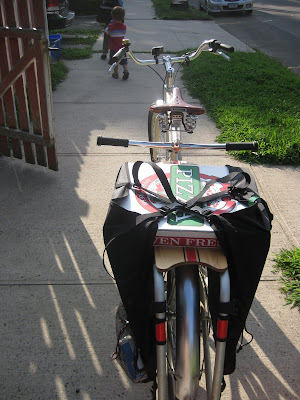 Your friend's Schwinn is awesome! DC has a great bike advocacy organization - it's called Washington Area Bike Association www.waba.com. I'm a card carrying member now! they do a really good job of working with the city council, etc. 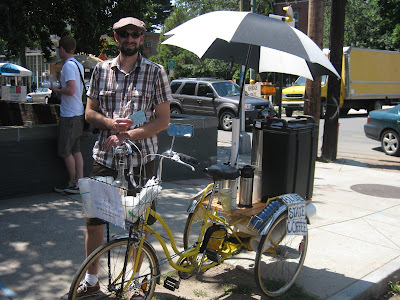 to make biking more DC friendly and have lots of events. Every year they do a bike-to-work day. On the note about safety, it does make you want to get mad. I've had comments/questions about my own safety, and once participated in a discussion about the level of safety of a man with an child seat on the back of his bike riding on deserted streets at dusk. If you even have a chance to discuss this with anyone, you can kind of sympathize with the person's desire for safety ("you know at first when I went out with my kids, i was also concerned about that, but then I did research and found that automobiles are statistically far, far greater danger and we choose to ride in those every day, day after day, year after year. 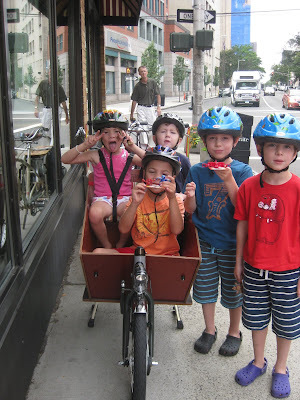 So, I decided to help my children by modeling a healthy lifestyle, and riding in cars less, since they are so dangerous"... Just give 'em a nugget to think about, even if it is hard to believe the statistic that cars are more dangerous to people that bikes. Its the same thing with people fear of flying in planes becasue you might crash, while people have no trouble riding in a car their whole lives. I found your site from the Path Less Pedaled website where you left a comment. It's great to see someone who is so involved in trying to make biking a part of everyday life. I grew up in Waterbury, CT where NO ONE rode bikes except my brother and me. Now I live in Portland, Maine, where biking is more accepted, yet still not the norm. I'd love to get out to Portland, OR (the OTHER Portland, as we like to say here) and see what the culture is like there. Keep up the good work!